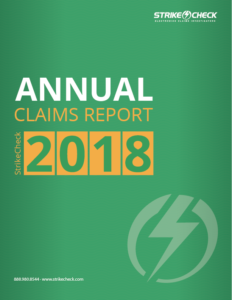 Charlotte, North Carolina, February 27, 2018 – StrikeCheck, a leading provider of electronics damage assessments for Property and Casualty insurance carriers nationwide, announced the release of its 2018 Annual Claims Report today. The data in this report provides an opportunity for property and casualty insurance carriers to identify where they can reduce the risk of indemnity leakage. Distributed to Property & Casualty insurance carriers nationwide, the 2018 Annual Claims Report includes an analysis of thousands of claims assigned to StrikeCheck by the nation’s top carriers. The statistics are derived from the results of residential and commercial onsite assessments in all 50 states and across all causes of loss. The data published in this report is presented in aggregate and segmented by equipment type, region, peril, and catastrophe claims. Beneficial topics include reported vs. actual peril, non-damaged frequency, repair vs. replace cost comparison, number of items claimed by peril and average age of equipment. Additionally, the report analyzes claims specific to two of the year’s most destructive catastrophes, Hurricanes Harvey and Irma. This report is available at no cost to insurance claim professionals. To request a copy, click here or email education@strikecheck.com. StrikeCheck investigates electronic and specialty contents claims, exclusively on behalf of insurance carriers, nationwide. We boast the industry’s most comprehensive manufacturer relationships and experience across thousands of investigations annually, to deliver cost-effective, comprehensive solutions for complex claims. To learn more about our services or to submit an assignment, please visit strikecheck.com, email claims@strikecheck.com, or contact us by phone at (888) 980-8544.